Let’s say you receive a form submission and want the information you just collected displayed on a single PDF document. Easy enough. Just copy the information, open a new word processing document, paste the information, and then save the whole thing as a PDF. But what if you wanted to turn 100 form submissions into their own separate PDFs? That would require some serious legwork, not to mention it’s tedious. That’s why we, as a leading online form creator software, are proud to introduce JotForm PDF Editor, a new way to automate polished, designed documents that you can share, download, or print with the click of a button. Responses you receive through your online forms are instantly and automatically turned into elegantly-designed PDFs. No copying and pasting required. How does this help you? Imagine you manage a restaurant and you’re using a JotForm job application form to hire new kitchen staff. You can send out an online application form like you always have. But when the responses come back, they are converted into beautiful PDFs that you can instantly forward along to colleagues, send back to the applicant, or keep for your own files. It’s the same information you’ve always collected, only now the final document is far superior. Below are a few standout features of JotForm PDF Editor. The beauty of PDF Editor is the ability to design your PDF however you’d like, including the ability to add sections, custom colors, and numerous fonts. You can even include images and your company logo. It requires very little effort and even less skill; just click and drag sections and text along a handy grid. You also have full control over how you’d like your response information to appear on the document, which can be displayed in landscape or portrait orientation. Designing a PDF with PDF Editor is a cinch, but if you wanted a jump start we have more than 100 snazzy PDF templates you can choose from. There’s one for just about any reason you’d need a professional PDF, including medical consent, supply requests, event registrations, and agreements. Best part? They’re free! A single online form can generate thousands of custom different PDFs — a new one created every time someone responds to your form. This level of automation is uncommon in the world of PDFs. Online forms are easier for your clients and colleagues to fill out, so you get more responses. And the work of turning the information into polished PDFs is automatically done for you. Are your PDFs to be read by a chosen few? Then password protection is your best friend. In our layout settings, just select “Enable Password Protection” and then type your new password. Only those people with the password will be able to access your document. JotForm PDF Editor makes distributing your new PDFs incredibly easy, boosting communication between colleagues and clients. When you’re in preview mode, you can toggle between the PDF submissions you receive and then download, print, or share in a single click at the top of the screen. The share option prompts an email draft with the attached PDF that you can immediately send. JotForm’s hallmark Fillable PDF Creator is now included as a feature in PDF Editor. Quickly build a PDF form with fillable fields that sends response information directly to your JotForm inbox. Now this feature is updated to make your fillable PDFs more customizable and attractive. To use this feature, make sure you and your respondents use Adobe Acrobat Reader when filling it out. You’ve always been able to collect e-signatures using JotForm. But now you can automatically have collected signatures stamped on new PDFs whenever someone submits your online form. Given how easy it is to fill out a JotForm form — even on mobile devices — your clients can sign agreements from wherever they are without hassle. No printing, scanning, or headaches necessary. Then you can return a signed agreement to them with a single click. 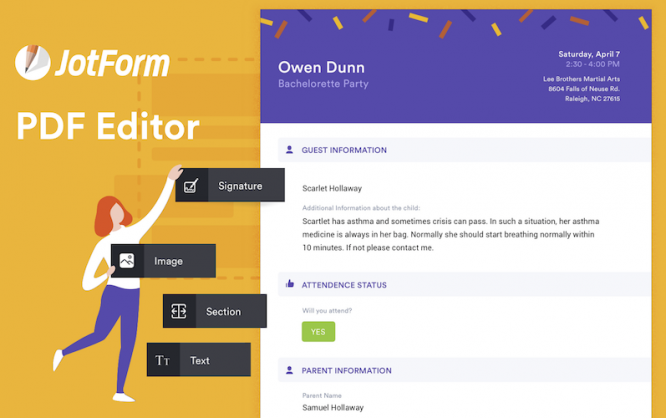 JotForm PDF Editor integrates seamlessly with Google Sheets, DropBox, and Box so that the PDFs generated from your form responses automatically send to cloud storage systems your team depends on. PDF Editor can change the way your organization creates documentation for contracts, agreements, waivers, intake, quality control, incident reporting, evaluations, and a lot more. Have you already giving JotForm PDF Editor a try? How are you using it? Let us know in the comments below! Very nice Jot Form it’s really nice Great Post. I was prescribed this site by my cousin. I’m uncertain about whether this post is composed by him as nobody else know such point by point about my concern. You are brilliant! Much obliged! Looks quite promising better than foxit pdf reader. Wow Very nice Its Really amazing Blog. Thank you so much Chad Reid for sharing this great article with us. This is very helpful guidance for me to turn form Responses into Designed PDFs. I’ll follow your tips. Thanks again. Great and informative blog. I like this content.